Action Lab Entertainment has released its solicitations for May. For s rundown, with images, CLICK HERE. For covers and exclusive four-page preview of Avengers #4.1, arriving in stores on Wednesday, Feb. 22 from Marvel Comics, CLICK HERE. Look for previews of all 28 of the Marvel Comics titles arriving in stores on Wednesday, Feb. 22 at midnight (ET) here in The Continuum. Warner Bros. Home Entertainment has set April 18 for the release of Teen Titans: The Judas Contract, the animated movie inspired by the 1984 DC story arc from Marv Wolfman and George Perez. The movie will also be released on Digital HD on April 4. Teen Titans will be available on Blu-ray Deluxe Giftset, Blu-ray Combo Pack and DVD. The Blu-ray Combo Pack includes the movie in high definition on Blu-ray Disc, a DVD and a digital version of the movie on Digital HD with UltraViolet. The Blu-ray Deluxe Edition will include all components of the Blu-ray Combo Pack, along with an exclusive figurine of Blue Beetle in a numbered, limited edition gift set. Led by Starfire, the Teen Titans -- Beast Boy, Raven, Blue Beetle, Robin and the just-returned Nightwing -- have built a cohesive team in their never-ending battle against evil. 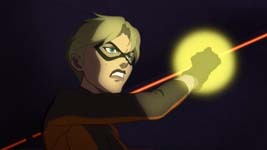 But their newest teammate, the mysterious and powerful Terra, may be altering that dynamic. Meanwhile, an ancient evil, Brother Blood, has awakened, and familiar foe Deathstroke is lurking in the shadows -- both waiting to pounce. Ultimately, the Teen Titans will need to battle their enemies and their own doubts to unite and overcome the malicious forces around them in this twisting tale of intrigue, adventure and deception." The cast features newcomers Christina Ricci as Terra and the last Miguel Ferrer as Deathstroke. Returning are Sean Maher as Nightwing, Taissa Farmiga as Raven, Jake T. Austin as Blue Beetle, Brandon Soo Hoo as Beast Boy, Kari Wahlgren as Starfire, and Stuart Allan as Robin/Damian. Gregg Henry voices the villainous Brother Blood. The voice cast also includes Maria Canals-Barrera as Jaime's mother, Meg Foster) as Mother Mayhem, Crispin Freeman as Speedy, Masasa Moyoas Bumblebee, David Zayas as Jaime's father, and Jason Spisak as Kid Flash. 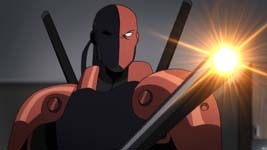 Teen Titans: The Judas Contract is directed by Sam Liu from a screenplay by Ernie Altbacker. Sam Register is executive producer, James Tucker is supervising producer and Alan Burnett is co-producer. The Blu-ray will include a sneak peek at the next DC animated movie, Batman and Harley Quinn, and a featurette on Wolfman and Perez. For a trailer for the movie, CLICK HERE. For covers and seven- to eight-page previews of Valiant Entertainment titles arriving in stores on Wednesday, Feb. 22, click on the cover thumbnails or the links below for the individual titles. * DIVINITY III: STALINVERSE #3. TOP COW PROMOTION: Elena Salcedo has been promoted to vice president of operations for Top Cow Productions. She will be handling the day-to-day operations and overseeing monthly comic book publishing. Salcedo started volunteering with Top Cow in the summer of 2006 before becoming an assistant in 2007. She was promoted to Director of Operations in 2010. As a vice president, Elena will report directly to Top Cow President Matt Hawkins and be an advisory to the company’s Board of Directors. 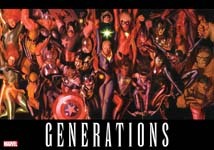 GENERATIONS: Marvel Comics has released a teaser image for Generations, which is scheduled for this summer. Below are solicitations posted for April. Click on the publisher's name for the full listings.